Back in 2001 a relative and fellow researcher sent me a copy of an entry in a parish register in response to my questions about the marriage of James Simms, a music teacher and organist at Bromsgrove, Worcestershire to Phoebe or Hebe. 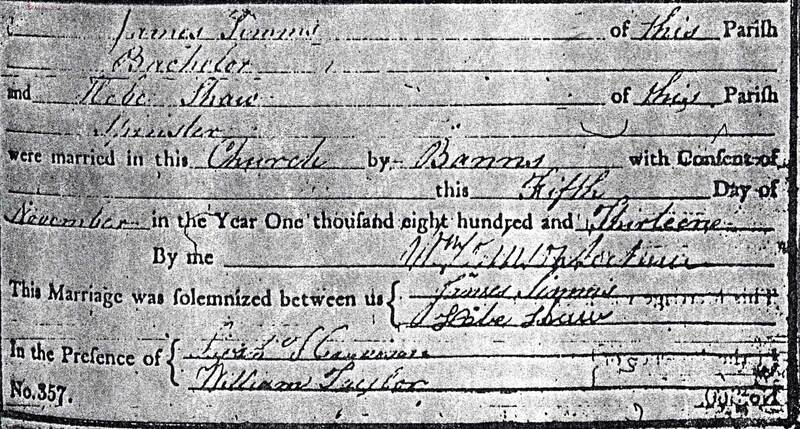 Marriage of James Simms and Hebe Shaw. St Martin, Birmingham parish (Warwickshire, England). Parish registers, Marriages, 1808-1817. Family History Library microfilm 919781. Original register DRO 34/37, Birmingham Central Library. Both bride and groom claimed to be ‘of this parish’. However, neither seems to have any connection to the parish as they were born in neighbouring counties and lived in Bromsgrove. James’ birthplace recorded on the 1851 census appears to be Swinston, Staffs. However there is no place of that name, but small village in Staffordshire named Swindon is likely to be the correct place. Hebe’s birthplace recorded on the 1851 census is Wolverley, Worcestershire. All the locations are within about 10 miles of St Martin’s church in the centre of Birmingham city. Although the 1753 Marriage Act (also known as Hardwick’s Act) directed that marriages should take place in the parish of residence of one of the parties, this requirement was not mandatory as the validity of a marriage could not be challenged on the grounds of non-residence. Evidence suggests the couple were not resident in the parish. The Bromsgrove burial register notes that James had been the organist at Bromsgrove for 43 years on his death in 1854, placing him in Bromsgrove from about 1811, two years prior to the marriage. The reasons why the couple chose St Martin’s may become apparent with further research. As a prominent church in a growing city, St Martin’s could have been a popular marriage location, and there may be as yet undiscovered family connections. So, is this the right couple? At present they think they probably are. I should check there are no other possible marriages in the parish registers for Wolverley and Swindon and surrounding areas. An important thing to note is that FamilySearch does not cover all parishes. Wolverley is included, but Swindon is not. Although checking the index on FamilySearch yields just this marriage in a search for James Simms and Hebe between 1790 and 1841, changing the bride’s forename to Phoebe yields another three possibilities. As they are from Wiltshire, London and Derbyshire, they are not more likely. Now that we have reached the 10th in the 50 Marriage Mondays series, I have noticed that the need for further research keeps recurring! Probert, Rebecca (2012) Marriage Laws for Genealogists. Takeaway: Kenilworth. p. 145. Thank you, this certainly does sound like the undiscovered family connection. I am very interested in what you know about the family’s musical connections. I will email you directly.